Around the world, the feeling is growing that the present order of things cannot continue as before. Following the revolts of the ‘Arab Spring’, the movements of the Indignados in Spain and then of Occupy in the United States in 2011, the summer of 2013 has seen huge crowds come out into the streets almost simultaneously in Turkey and Brazil. Hundreds of thousands, even millions, have protested against all kinds of evils: in Turkey it was the destruction of the environment by a senseless urban “development”, the authoritarian intrusion of religion into private life and the corruption of politicians; in Brazil it was the increased cost of public transport, the diversion of wealth towards spending on prestige sports activities while health, transport, education and housing are falling apart – and again, the widespread corruption of politicians. In both cases, the initial protests were met with brutal police repression which only broadened and deepened the revolt. And in both cases, the spearhead of the movement was not the “middle class” (that is to say, in media language, anyone who still has a job), but the new generation of the working class who, although educated, have only a meagre prospect of finding a stable job and for whom living in an “emerging” economy means above all observing the development of social inequality and the repugnant wealth of a tiny elite of exploiters. That is why, today, a ‘spectre is haunting the world’: the spectre of INDIGNATION. Just over two years after the ‘Arab Spring’ which shook and surprised the countries of North Africa, and whose effects are still being felt; two years after the movement of the Indignados in Spain and Occupy in the USA; and at exactly the same time as the movement in Turkey, the wave of demonstrations in Brazil has mobilised millions of people in over a hundred cities and shown characteristics which are unprecedented for this country. The revolts in Turkey and Brazil in 2013 prove that the momentum created by these movements is not exhausted. Although the media evade the fact that these rebellions arose in countries which have been in a phase of “growth” in recent years, they could not avoid showing the same “outrage” of the masses of the population against the way this system works: growing social inequality, the greed and corruption of the ruling class, the brutality of state repression, weakness of the infrastructure, environmental destruction. Above all, the system’s inability to provide a future for the younger generation. One hundred years ago, faced with the First World War, Rosa Luxemburg solemnly reminded the working class that the choice offered by the capitalist order in decay was between socialism or barbarism. The inability of the working class to carry through the revolutions that were its response to the war of 1914-1918 resulted in a century of real capitalist barbarism. Today, the stakes are even higher, because capitalism has the means to destroy all life on earth. The revolt of the exploited and oppressed, the massive struggle to defend human dignity and a real future; that is the promise of the social revolts in Turkey and Brazil. A particularly significant aspect of the revolt in Turkey is its proximity to the bloody war in Syria. The war in Syria also began with popular protests against the regime there, but the weakness of the proletariat in this country, and the existence of deep ethnic and religious divisions within the population, allowed the regime to respond with most brutal violence. Divisions within the bourgeoisie widened and the popular revolt – as in Libya in 2011 –turned into a ‘civil war’ that has become a proxy war between imperialist powers. Syria is now transformed into a case study of barbarism, a chilling reminder of the alternative that capitalism has in store for mankind. In countries such as Tunisia and especially Egypt, where the social movement showed the real weight of the working class, the movements were unable to withstand the pressure of the dominant ideology and the situation is in the process of degenerating into a tragedy for the population, above all for the proletarians, who are becoming victims of the gangs and clashes between religious fundamentalists, supporters of the former regime and other rival factions of the bourgeoisie who have recently turned the national situation into bloody chaos. On the other hand, Turkey and Brazil, like other social revolts, continue to show the way that is open to humanity: the way to the rejection of capitalism, to the proletarian revolution and the construction of a new society based on solidarity and human needs. The movement of May/June began in opposition to the cutting down of trees to destroy Gezi Park in Taksim Square in Istanbul, and grew to a size unknown in the country’s history to date. Many sectors of the population, dissatisfied with recent government policy, participated, but what precipitated the masses in the streets was state terror and this same terror caused a profound stir in a large part of the working class. The movement in Turkey is not only part of the same dynamic as the revolts in the Middle East in 2011, the most important of which (Tunisia, Egypt, Israel) have been strongly marked by the working class, but is above all a direct continuation of the Indignados movement in Spain and Occupy in the United States, where the working class represents not only the majority of the population as a whole but also of the participants in the movement. The same is true of the current revolt in Brazil, where the vast majority of those involved belong to the working class, especially the proletarian youth. The sector that participated the most in the movement in Turkey was the one dubbed the “1990s generation.”Apoliticism was the label given to this generation, many of whom could not remember the time before the AKP government2. The members of this generation, who were said to be unconcerned with the social situation and only sought to help themselves, understood that there was no salvation on their own. They have had enough of the government telling them what to do and how to live. Students, especially high school students, participated in the demonstrations in a massive way. Young workers and unemployed youth were largely present in the movement. Workers and educated unemployed were also present. One part of the working proletariat also participated in the movement and formed the main body of the proletarian tendency within it. The Turkish Airlines strike in Istanbul tried to join the struggle at Gezi. Particularly in the textile sector we saw voices expressed in this way. One of these protests was held in Bagcilar-Gunesli, in Istanbul, where textile workers, subjected to harsh conditions of exploitation, wanted to express their class demands at the same time as they declared their solidarity with the struggle at GeziPark. They protested with banners saying “Greetings from Bagcilar to Gezi!”and “Saturday should be a day off!”. In Istanbul, workers with banners saying “General strike, general resistance” called on others to join them during a march attracting thousands of them in Alibeykov; or again “No to work, fight!”as carried by shopping centre and office employees gathered in Taksim Square. In addition, the movement has created a will to fight among unionized workers. Undoubtedly, KESK, DISK and other union organisations that called for strikes had to do so, not only because of social networking but under pressure from their own members. Finally, the platform of the various branches of Istanbul Turk-Is3, an emanation of all the local unions of Istanbul, called on the organisation and all other unions to declare a general strike against the state terror on the Monday after the attack against Gezi Park. If these calls were made, it was because there was an outrage among the membership over what had happened. The social movements last June have a particular significance for the proletariat of Brazil, Latin America and the rest of the world, and to a large extent went beyond the traditional regionalism of the country. These massive movements were radically different from the ‘social movements’ controlled by the state, by the PT (Workers’ Party) and other political parties, such as the Landless Workers’ Movement (MST); similarly, it was different from other movements which have arisen in various countries of the region in the last decade or so, like the one in Argentina at the beginning of the century , the ‘indigenous’ movements in Bolivia and Ecuador, the Zapatista movement in Mexico or Chavism in Venezuela, which were the result of confrontations between bourgeois or petty bourgeois factions, disputing control of the state and the defence of national capital. In this sense, the mobilisations of June in Brazil represent the largest spontaneous mass mobilisation in this country and in Latin America for the past 30 years. This is why it is essential to learn the lessons of these events from a class point of view. It is undeniable that this movement surprised the Brazilian and world bourgeoisie. The struggle against the public transport price rises (which are negotiated each year between the transport chiefs and the state) was just the detonator of the movement. It crystallised all the indignation which had been brewing for some time in Brazilian society and which took shape in 2012 with the struggles in public administration and in the universities, mainly in São Paulo, also with a number of strikes against wage cuts and insecure working conditions and against health and education cuts over the last few years. Unlike the massive social movements in various countries since 2011, the one in Brazil was engendered and unified around a concrete demand, which made it possible for there to be a spontaneous mobilisation of wide sectors of the proletariat: against the rise in public transport fares. The movement took on a massive character at the national level from the 13th June, when the demonstration in São Paulo against the fare increases called by the MPL (Movimento Passe Livre – Movement for Free Access to Transport)4, as well as by other social movements, were violently repressed by police in Sao Paulo5. For five weeks, in addition to large protests in São Paulo, various protests were held around the same demand in different cities in the country, so much so that, for example, in Porto Alegre, Goiânia and other cities, the pressure forced several local governments, whatever their political colour, to agree to revoke the higher transport prices, after hard struggles strongly repressed by the state. The movement straight away situated itself on a proletarian terrain. In the first place, we should underline that the majority of the participants belong to the working class, mainly young workers and students, mainly coming out of proletarian families or those undergoing proletarianisation. The bourgeois press has presented the movement as an expression of the ‘middle classes’, with the clear intention of creating a division among workers. In reality, the majority of those categorised as middle class are workers who often receive lower wages than skilled workers in the country’s industrial zones. This explains the success of, and the widespread sympathy with, the movement against the transport increases, which represented a direct attack on the income of working class families. This also explains why this initial demand rapidly turned into the questioning of the state, given the dilapidation of sectors such as health, education and social assistance, and increasing protests against the colossal sums of public money invested in organising next year’s World Cup and the 2016 Olympics.6. For these events the Brazilian bourgeoisie has not hesitated to resort to the forced expulsion of people living near the stadia: at the Aldeia Maracanã in Rio in the first part of the year; in the zones chosen by construction firms in São Paulo, who have been burning down favelas in the way of their plans. It is very significant that the movement organised demonstrations around the football stadia where Confederation Cup matches were being played, in order to get a lot of media attention and to reject the spectacle prepared by the Brazilian bourgeoisie; and also in response to the brutal repression of the demonstrations around the stadia, which resulted in a number of deaths. In a country where football is the national sport, which the bourgeoisie has obviously used as a safety valve for keeping society under control, the demonstrations of the Brazilian proletariat are an example for the world proletariat. The population of Brazil is known for its love of football, but this didn’t prevent it from rejecting austerity imposed to finance the sumptuous expenses devoted to the organisation of these sporting events, which the Brazilian bourgeoisie is using to show the world that it is capable of playing in the premier league of the world economy. The demonstrators demanded public services with a ‘FIFA type’ quality7. An extremely significant fact was that there was a massive rejection of the political parties (especially the Workers’ Party, the PT which produced the current president Lula)) and of the unions; in São Paulo some protestors were excluded from the marches because they held up banners with slogans of political, union or student organisations supporting the power. Other expressions of the class character of the movement were shown, even though in a minority. There were a number of assemblies held in the heat of the movement, even though they did not have the same extension or reach the level of organization of the Indignados in Spain. For example the ones in Rio de Janeiro and Belo Horizonte, which were called ‘popular and egalitarian assemblies’ which proposed to create a “new spontaneous, open and egalitarian space for debate”, in which over 1000 people took part. They put forward a localist or national vision, struggling against the effects of problems rather than their causes, without questioning capitalism. Various bourgeois political trends have been active, trying to influence the movement from the inside to keep it within the boundaries of the existing order, to avoid it radicalising and prevent the proletarian masses who took to the streets against state terror from developing class demands around their living conditions. So, while we cannot claim that they were adopted unanimously in the movement, it was democratic demands which generally dominated. The line calling for “more democracy” that formed around an anti-AKP, or rather anti-Erdogan position, expressed nothing but a reorganization of the Turkish State apparatus on a more democratic basis. The impact of democratic demands on the movement was its greatest ideological weakness. For Erdogan himself has built all his ideological attacks against the movement around the axis of democracy and elections; government authorities combining lies and manipulations repeated ad nauseam the argument that, even in countries considered more democratic, the police use violence against illegal demonstrations – in which they were not wrong. In addition, the line aimed at obtaining democratic rights tied the hands of the masses faced with police attacks and state terror and pacified their resistance. The national bourgeoisie has for decades been working to make Brazil a major continental or world power. To achieve this, it’s not enough to dispose of an immense territory which covers almost half of South America, or to count on its important natural resources. It has also been necessary to maintain social order, above all control over the workers. Thus in the 1980s it established a kind of alternation between right and centre left governments, based on ‘free and democratic’ elections. All this was indispensable for strengthening Brazilian capital on the world arena. The Brazilian bourgeoisie was thus better placed to reinforce its productive apparatus and face up to the worst of the economic crisis of the 90s, while on the political level it succeeded in creating a political force which could control the impoverished masses, but above all maintain social peace. This situation was consolidated with the accession of the PT to power in 2002, making use of the charisma and ‘working class’ image of Lula. In this way, during the first decade of the new century, the Brazilian economy raised itself to seventh place on the world ladder, according to the World Bank. The world bourgeoisie has hailed the ‘Brazilian miracle’ carried out under Lula’s presidency, which has supposedly pulled millions of Brazilians out of poverty and allowed more millions to enter this famous ‘middle class’. In fact, this ‘great success’ has been achieved by distributing a part of the surplus value as crumbs to the most impoverished, while at the same time the situation of the mass of workers has become ever more insecure. The crisis nevertheless remains at the root of the situation in Brazil. To try to attenuate its effects, the Brazilian bourgeoisie has launched a policy of major works, provoking a construction boom in both the public and private sectors; at the same time it has been facilitating credit and debt among families to stimulate internal consumption. The limits are already tangible in the economic indicators (a slowdown of growth), but especially in the deterioration of working class living conditions: rising rates of inflation (an annual forecast of 6.7% in 2013), increased prices of consumer goods and services (including transport), a marked development of unemployment, cuts in public spending. 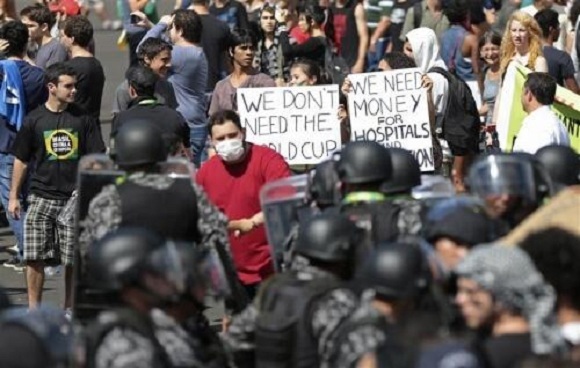 So, the protest movement in Brazil does not come from nowhere. The only concrete result obtained under pressure from the masses was the suspension of the increase in public transport fares that the state managed to compensate for in other ways. At the beginning of the wave of protests, to calm things down while the government worked out a strategy to control the movement, President Dilma Rousseff declared, via one of her mouthpieces, that she considered the population’s protests as “legitimate and compatible with democracy”. Lula meanwhile criticised the “excesses” of the police. But state repression didn’t stop, and neither did the street demonstrations. One of the most elaborate traps against the movement was the propagation of the myth of a right wing coup, a rumour spread not only by the PT and the Stalinist party, but also by the Trotskyists of the PSOL (PartidoSocialismo e Liberdade) and PSTU (Partido Socialista dos TrabalhadoresUnificados): this was a way of derailing the movement and turning it towards supporting the Rousseff government, which has been severely weakened and discredited. In reality the facts show precisely that the ferocious repression against the protests in June by the left government led by the PT was equally if not more brutal than that of the military regimes. The left and extreme left of Brazilian capital are trying to obscure this reality by identifying repression with fascism or right wing regimes. There is also the smokescreen of ‘political reform’ put forward by Rousseff, with the aim of combating corruption in the political parties and imprisoning the population on the democratic terrain by calling for a vote on the proposed reforms. In fact, the Brazilian bourgeoisie showed more intelligence and know-how that its Turkish counterpart, which mostly confined itself to repeating the cycle of provocation/repression faced with social movements. To try to regain an influence within the movement on the street, the political parties of the left of capital and the trade unions announced, several weeks in advance, a ‘National Day of Struggle’ for the 11 July, presented as a way of protesting against the failure of the collective labour agreements. Similarly, Lula, showing his considerable anti-working class experience, called on 25 June for a meeting of the leaders of movements controlled by the PT and the Stalinist party, including youth and student organisations allied with the government, with the explicit aim neutralising the street protests. Just as was the case with the Indignados movement and Occupy, these mobilizations have responded to the will to break with the atomisation of economic sectors where mostly young people work in precarious conditions (delivering for kebab shops, bar staff, workers in call centres and offices ...) and where it is usually difficult to struggle. An important driver of engagement and commitment is indignation but also the sense of solidarity against police violence and state terror. But at the same time it is often as individuals that the largest concentrations of workers participated in the demonstrations, which has been one of the most significant weaknesses of the movement. The living conditions of the proletarians, subject to the ideological pressure of the ruling class in this country, have made it difficult for the working class to perceive itself as a class and helped to reinforce the idea among the demonstrators that they were essentially a mass of individual citizens, legitimate members of the “national” community. The movement, having not recognised its own class interests, found its possibilities for maturation blocked, the proletarian tendency within it having remained in the background. This situation has contributed a good deal to the focus on democracy, the central axis of the movement against government policy. A weakness of the demonstrations throughout Turkey has been the difficulty of creating mass discussions and gaining control of the movement through forms of self-organisation. This weakness was certainly favoured by a limited experience of mass discussion, meetings, general assemblies, etc. However at the same time the movement has felt the need for discussion, and the means to organise it began to emerge, as evidenced by some isolated experiences: the creation of an open forum in Gezi Park, which did not attract much attention or last very long, but nevertheless had some impact; during the strike of June 5, employees of the university who were members of Eğitim-Sen8 suggested establishing an open forum but the KSEK leadership not only rejected the proposal but also isolated the Eğitim-Sen branch to which the university employees belong. The most crucial experience was provided by the Eskişehir demonstrators who, in a general assembly, created committees to organise and coordinate the demonstrations; finally, on 17 June, in parks in different areas of Istanbul, masses of people inspired by the Gezi Park forums put in place mass assemblies also called “forums”. In the following days, others were held in Ankara and other cities. The most discussed issues related to problems of the clashes with the police. Nevertheless, there has been a tendency among the protesters to understand the importance of involvement in the struggle of part of the working proletariat. Although the movement in Turkey failed to establish a serious relationship with the whole of the working class, the strike calls via social networks had a certain echo that was manifested in work stoppages. In addition, proletarian tendencies were clearly revealed in the movement through elements who were conscious of the importance and strength of the class and who were against nationalism. In general, a significant portion of the protesters defended the idea that the movement must create a self-organisation that would allow it to determine its own future. Moreover, the number of people who said that unions like KSEK and DISK, supposed to be “militant”, were no different from the government, grew significantly. Finally, another characteristic of the movement, and not least: Turkish protesters welcomed the response from the other end the world with slogans in Turkish: “We are together, Brazil + Turkey!” and “Brazil resists!”. The great strength of the movement was that, from the beginning, it affirmed itself as a movement against the state, not only through the central demand against the fare increases but also as a mobilisation against the abandonment of public services and the orientation of spending towards the sporting spectacles. At the same time the breadth and determination of the protest forced the bourgeoisie to take a step back and annul the fare increases in a number of cities. The crystallisation of the movement around a concrete demand, while being a strength of the movement, also put limits on it as soon as it was unable to go any further. Obtaining the suspension of the fare increases marked a step forward, but the movement did not on the whole see itself as challenging the capitalist order, something which was much more present in the Indignados movement in Spain. The distrust towards the bourgeoisie’s main forces of social control took the form of the rejection of the political parties and the trade unions, and this represented a weakness for the bourgeoisie on the ideological level, the exhaustion of the political strategies which have emerged since the end of the dictatorship of 1965-85 and the discrediting of the teams which have succeeded each other at the head of the state, in particular as a result of their notoriously corrupt character. However, behind this undifferentiated rejection of politics stands the danger of the apoliticism, which was an important weakness of the movement. Without political debate, there is no possibility of taking the struggle forward, since it can only grow in the soil of discussion which is aimed at understanding the roots of the problems you are fighting against, and which cannot evade a critique of the foundations of capital. It was thus no accident that one of the weaknesses of the movement was the absence of street assemblies open to all participants, where you could discuss the problems of society, the actions to carry out, the organisation of the movement, its balance sheet and its objectives. The social networks were an important means of mobilisation, a way of breaking out of isolation. But they can never replace open and living debate in the assemblies. Despite the majority of participants in the movement being proletarians, they were involved in an atomised way. The movement didn’t manage to mobilise the workers of the industrial centres who have an important weight, especially in the São Paulo region. It wasn’t even proposed. The working class, which certainly welcomed the movement and even identified with it, because it was struggling for a demand which it saw was in its interest, did not manage to mobilise as such. This attitude is a characteristic of the period where the working class is finding it hard to affirm its class identity, aggravated in Brazil by decades of immobility resulting from the action of the political parties and the unions, mainly the PT and the CUT. The emergence of social movements of massive size and unparalleled historical importance since 1908 in Turkey, and for 30 years in Brazil, give an example to the world proletariat of the response of a new generation of proletarians to the deepening global crisis of the capitalist system. Despite their differences, these movements are an integral part of the chain of international social movements, of which the mobilisation of the Indignadosin Spain constitutes a reference point, in response to the historic and mortal crisis of capitalism. Despite all their weaknesses, they are a source of inspiration and lessons for the world proletariat. As for their weaknesses, they must be the subject, for the proletarians themselves, of an uncompromising critique to draw their lessons so that, tomorrow, they will arm future movements by helping them avoid the ideological influence and traps of the enemy class. These movements are nothing other than the manifestation of “the old mole” of Marx, which continues to dig away at the foundations of the capitalist order. 1See our series of articles on the Indignados movement in Spain, especially in International Review n° 146 (3rd quarter 2011) and no 149 (3rd quarter 2012). 2Adaletve KalkinmaPartisi(Party for Justice and Development).This ‘moderate’ Islamist party has been in power in Turkey since 2002. 3Confederation of Turkish Trade Unions. 4 Faced with rising transport fares, the MPL conveyed strong illusions about the state by claiming that, by popular demand, it could guarantee the right to free public transport for the whole population faced with private transport companies. 5See our article ‘Brazil: police repression provokes the anger of youth’, published on our website on 20 June 2013 and in our printed territorial press. 6 According to forecasts, these two events will cost the Brazilian government $31.3 billion or 1.6% of GDP while the "Family Allowance" program, presented as the Lula government’s key social measure, represents less than 0.5% of GDP. 7FIFA –International Federation of Association Football. 8Teachers' union, part of KSEK.